Thank you for visiting the Home Decor section of Ittadi. Click on the photo to view our collection of handcrafted Cushion Covers . Our signature collection are the beautiful Kantha embroidered Cushion designs (covers) which have a modern and international feel and look. 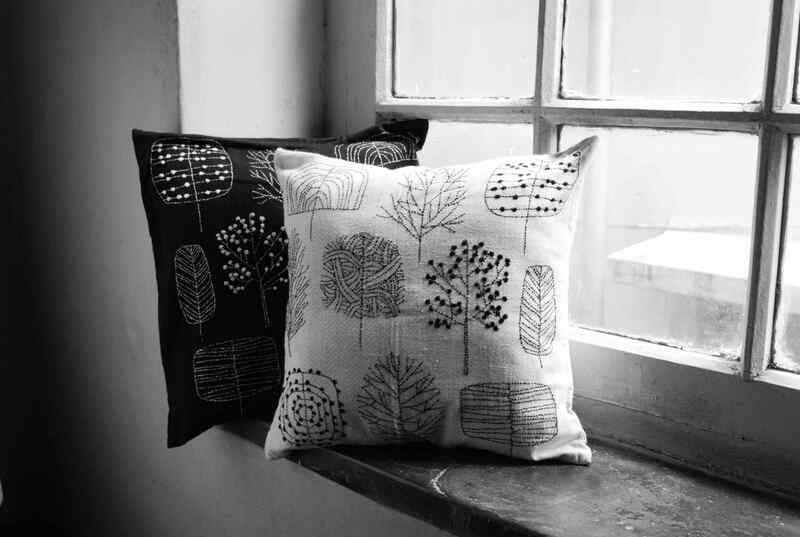 Among our most popular collections is our range of indigo & black pillow cover design which has been much appreciated. These have hand block printed inner lining and also with hidden zipper as a closure. At Ittadi, we design our products to add style & a warm aura to your home. Our latest addition to repertoire are the Calligraphy patchwork pillow cover design. The abstract 'tankas' are embroidered at placements on the patchwork calligraphy prints. It has a variety of closures - the buttoned, zippered and also the classic overlap closure. Consequently, it adds a drama to the little wanted corner of your home. We keep track of the latest trends in home decor, particularly cushion covers & improvise accordingly. Furthermore, we take inspiration from the world around us, the culture we live in today & recommendations from our patrons worldwide. Please keep coming back to our page as we look to expand our current range of cushion design collections in the coming months.We are currently working to introduce more home decor items as we strive to add varieties for our visitors.